“Turks & Caicos Born” alcoholic ginger beer debuts in Caribbean and US markets. Islander Ginger Beer is based on a recipe rich in TCI history and tradition. Most people know that the Salt Islands—Grand Turk, Salt Cay, and South Caicos—were known throughout the Northern Hemisphere for their export of sea salt, an important preservative, during the 17th and 18th centuries. Although that industry exists no longer, one of its descendants has created another product with the potential to attract similar attention: Islander Ginger Beer. The true-to-history formulation offers a thirst-quenching, 5% alcohol beverage that is perfect for warm weather, and sure to appeal to the rapidly expanding market for hard ciders and craft beers. Salt Cay’s historic salinas play a part in ginger beer’s fascinating history. Georgia Dunn, who is a 13th-generation descendent of Thomas Harriott, recalls during her childhood on Salt Cay many Turks Islanders brewing fermented ginger beer for their own consumption. This memory spurred Georgia on her mission to re-create and market the distinctive beverage. She recalls, “I was living on Grand Turk and an avid consumer of the fermented ginger beer produced at the time by a Canadian couple there. They chose to return home and were interested in having someone continue the business.” It sounded like a good idea, until Georgia discovered that the product lacked shelf life and was not commercially viable. Enamored of the idea of bringing back a truly local product, the budding entrepreneur returned to the US for nearly two years. During this time, she carefully researched ginger beer’s original formulation, combing various archives to find 17th and 18th century recipes. Then, she worked with the food research departments at North Carolina State University, Appalachian State, and the “fermentation Vatican” at University of California-Davis to create an FDA approved fermented ginger beer that could be produced and distributed throughout the Caribbean, as well as around the world. Georgia, who serves on the Board of the National Museum of Bermuda along with such distinguished members as Winston Churchill’s grandson and the Vanderbilts, had a global network of contacts to consult with. It included Bacardi, which ultimately referred her to the brewery that they use for a beer distributed in South Florida. This led Georgia to a new way to spend her 16-hour days: working with the brewer on the proper formula for producing batches larger than her original one gallon-recipe, obtaining proper permits, and exploring the best way to market the exciting new product. And, of course, Islander Ginger Beer must be available in Turks & Caicos first and foremost. During an early-November visit here, IGA agreed to be the country-wide wholesaler/retailer, following a tasting that garnered universal approval. Georgia and her husband Bill met with as many resorts as possible during their quick visit, with each eager to carry the beverage in their bars and restaurants. Then, it was back to the brewery where Georgia personally supervised production of the first large batch on November 14, 2014, with distribution and marketing to begin in the Caribbean islands of Bermuda and Cayman and the United States, starting with North and South Carolina and Florida. Georgia Dunn is a woman in the throes of a passion. Committed, full of energy, and quite determined, she knows she could be a part of a larger trend in the beverage industry. An article in Investor’s Business Daily this summer noted the trending of hard cider as the new “it” drink on the rise around the US, commenting that it appeals to changing consumer tastes in alcoholic beverages. It says that “Consumers are willing to try new things if it’s something interesting, something different, and something benefiting to them. Today’s consumers tend to look for quality and authenticity and a connection to nature.” Hmmm . . . sounds like Islander Ginger Beer to me! Not only is it gluten-free and full of fresh, healthful ingredients, but the back-story is fascinating. Georgia, like others, believes that the TCI should continue a thoughtful strategy of “less is more,” focusing on fewer visitors who appreciate a pristine environment with the best beaches in the Caribbean to boost the economy while protecting its natural resources, ensuring that the country remains “Beautiful by Nature” for years to come. She recalls the visionary leaders of Parrot Cay, Pine Cay, and Salt Cay who, years ago, carefully and thoughtfully built establishments which created a premier luxury destination, collectively benefitting the Islands as a whole. She firmly believes that Islander Ginger Beer is a product that, in its own modest way, can become a brand ambassador to draw just the right kind of attention to the Turks & Caicos Islands. 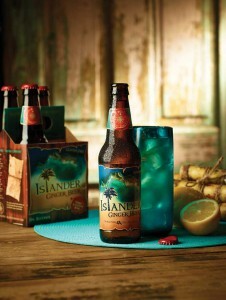 For more information, visit www.islandergingerbeer.com. How do we get the ginger beer sent to Wisconsin? I think your article is very well done. It provides a fascinatingly interesting retrospective of your region of the Caribbean and its historical significance. I commend your enthusiastic dedication to making your dream come true and have every reason to believe it will. Keep up the good (hard) work. You’re reward is on the near horizon! … and you are a delight! !